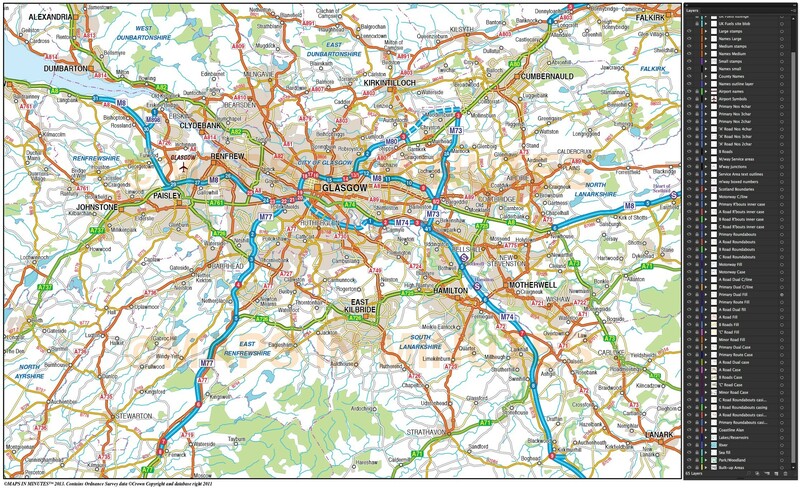 Glasgow large area map giving good detail and area coverage. These city plans have been developed to be equally at home in print and screen environments and are licenced for use on websites. Being vector format they are 100% editable so they are easily customised and can be used up to any size. This also doubles up as a West Midlands county map. Large scale, up-to-date, detailed, 100% editable layered vector map. Suitable for use from A3 to A2+. Greater Birmingham-Coventry map giving good detail and area coverage. These maps have been developed to be equally at home in print and screen environments and are licenced for use in print, on websites and even in Apps. Being vector format they are 100% editable so they can be easily customised. Available in Illustrator CS (PDF format coming soon). Layers include: Coastlines, county boundaries, county fills (as separate objects). Settlements layered by population. Road layers include motorways (including m'way junctions, junction numbers and service stations & names) Primary routes and 'A' roads (including dual carriageways)), 'B' roads, a comprehensive selection of 'C' and minor roads, comprehensive road numbering, railways, airports and airport names. Physical features include urban areas, forest and woodland, rivers and river names, lakes and lake names, mountain ranges, island names, bay and headland names. Map dimensions: 20.2" W x 13.2" D (51.5cm W x 33.3cm D). Authors notes: A great map for businesses in this area. 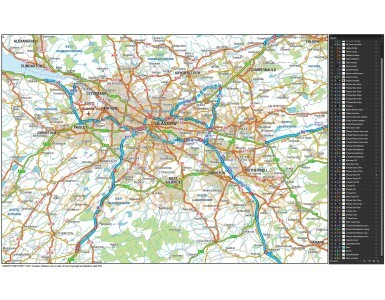 If you would like a custom map created to your requirements please Contact Us for a quote or give us a call to discuss.